Definition: Avogadro’s Law describes the relationship between the number of moles (n) and volume (V) while temperature (T) and pressure (P) remain constant. Relation: n and V are directly proportional so as “n” increases, volume increases. 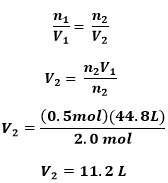 Problem: If a the volume of 2 mol of helium gas is 44.8L, what is the volume of 0.5 mols of the same gas?